Edgar is a venture started together with Marusa, the designer and two developer friends. Edgar gives brands the tools and access to the best creatives (brand storytellers, writers, illustrators), so that they can delight their customers with awesome stories. Small brands, crafters and makers don’t have the budget to hire quality admen or creatives to help them engage with customers. Hiring freelancers, on the other hand, is a gamble and a time-consuming activity. Especially as brands themselves lack the skills to pick the right person for the job. Small, family run brands often already have meaningful stories, they simply need a way to create and publish them. Edgar is a two-sided solution. A set of visual storytelling tools and a curated marketplace of brand storytellers. In a team of two developers and an illustrator, my role was to be the product as well as the business guy. Responsible for: Product development & management, User research, Product design (with Marusa), UX strategy. The idea to explore the commercial feasibility of a storytelling-as-a-service solution was something Marusa and me discussed since 2011. But it was only after meeting up with two of my brilliant computer science students that we crafted a prototype. After pitching the idea in Berlin (May 2013) and winning the first (and second) place at the Startup Weekend it was time to validate it on the market. I combined typical user research with the Lean startup methodology to find the perfect painkiller. The three-month research took place in Slovenia and mostly in the US. The findings were used to design the personas, user journey maps and craft the unique value proposition. We visited this craftsy couple that operates under the KRT brand. The fifth Conrad in the Fürst family revived his family winery. And he has stories. Bunch of them. Drago, a winemaker from the Slovenian Vipava Valley has some of the best wines. And sweet stories. 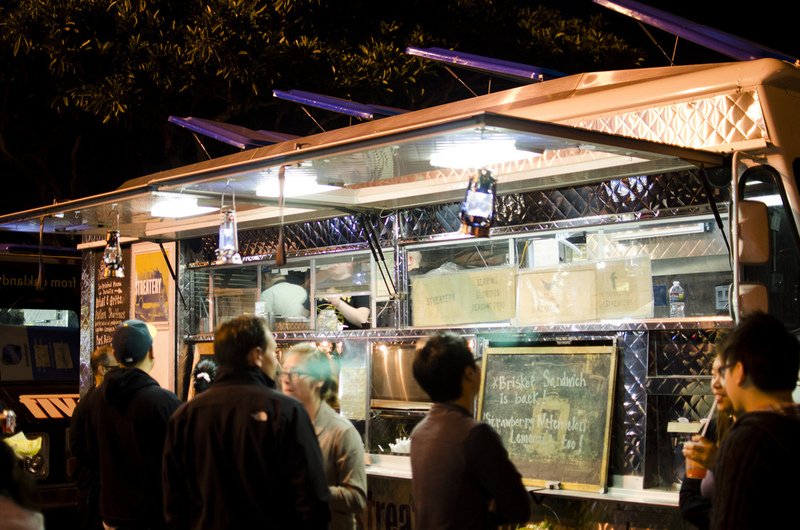 The food crafters in the Valley were a source of insight and inspiration. Research findings were illustrated on the drawing board and in numerous (more than 20!) journey maps. Obsessed with stories, we communicated all our findings in form of stories. From our slide deck, to the business plan - we used our users as heroes in the stories. And it worked both with new hires as well as with investors and clients. The name Edgar was chosen during the Startup weekend and it was love at first sight. Edgar became much more than a name and a logo. It became our little fellow and we, the team became Edgars. Edgar is a quirky gentleman, the guy with the hat who’s in love with everything craft & art. He’s an Easy regular and his girlfriend Olive is the biggest fan of Threadless. This little fellow with the hat is following the team wherever we go and in the two years, Edgar became the hero of many stories. In Autumn 2013 we launched the v 1.0. of the visual storytelling tool made for makers, crafters and all the small businesses who had problems telling their brand and product stories. The first version was done in weeks, and we life tested it with selected users. Initial feedback was fed back to the drawing board where I created hundreds of paper screens and created what we call the “paper stories"
From day one, the Edgar Crafter tool was a mobile first designed web application. Designing Edgar was my dream come true as I could combine my love for writing quirky copy with my passion for fun UX. Edgar uses a truly unique tone of voice. The whole flow was designed with care including the copy. We enabled small businesses to easily create visual stories by importing their credentials and content from Facebook and Etsy. Edgar was designed for makers and crafters, though not only for tech-savvy Etsy sellers, but also for those little winemakers with punchy wine but no patience with the technology. When designing the UX, my mission was to make it pleasant, fun and empowering from the moment users signed up. We enabled small businesses to easily create visual stories by importing their credentials and content from Facebook and Etsy. The Crafter is the first tool we launched to enable people to tell short, visual stories. Each story can have up to 7 moments that can be simple text, images, videos or you favourite tweets or instagrams. Yes, there's the Medium similarity. But it works. Especially with nice little hints and nudges. The Crafter is the manifestation of the WYSIWYG UI philosophy. We make it super easy to better use all those photos that hide on your computer desktop. Instagram, Twitter, Flickr... we got it. Always wanted to create stories from your existing Instagrams or Tweets. Now you can. Each story is equiped with a title, abstract and some facts that make it easier to discover. 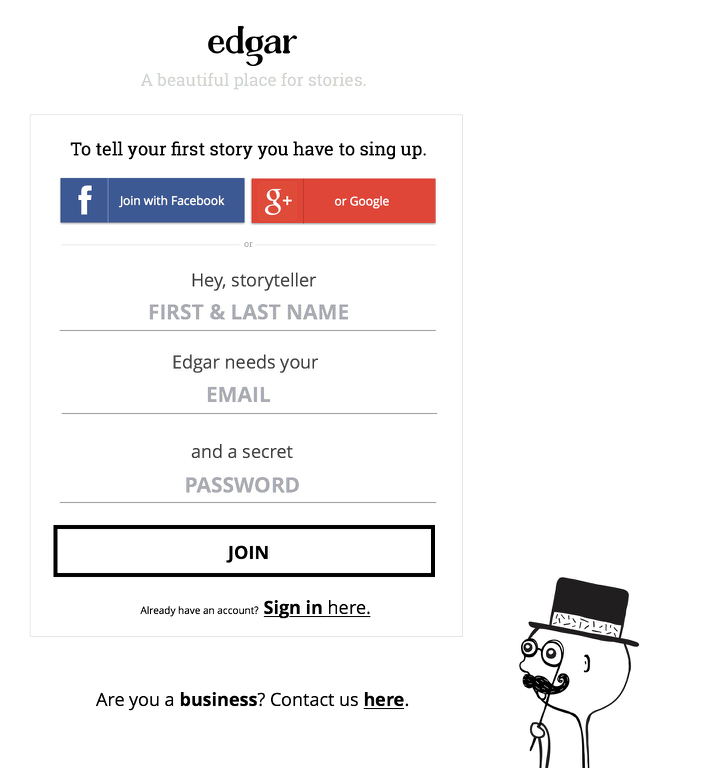 Each business owner can use Edgar to equip her stories with unique feats such as the business card, sell link, a link to Etsy or even an interactive poll to engage with the story viewers. From horizontal brand story to vertical shared experience. With added CTAs such as the "Purchase" button. Each business account can create their business card. It's as simple as importing your Etsy credentials. Add CTAs such as polls right inside the story. Stories made with Edgar are meant to be shared, embedded, loved and talked about. Stories come to life. Wherever. Whenever. Stories made with Edgar are visual, with a minimal interface so that viewers can enjoy the content in its full-screen glory. Landing website v 1.1. (top), the Stories site (above) and the mobile menu (right). We launched the Edgar Marketplace in May 2014, to connect businesses with best brand storytellers around. We started with 70 hand-picked storytellers: writers, illustrators, brand designers and micro content ninjas.